Ori Gold is the CEO of programmatic platform Bench, and here discusses the impact of science and technology innovation and the best way for marketers to deal with this rapid and constant change. Embracing complexity and applying the scientific approach of test and learn is central to thriving in the changing world of marketing and business. 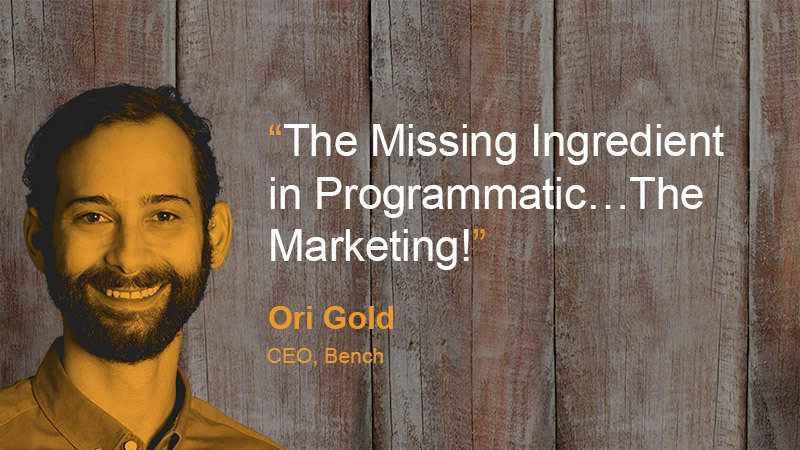 Welcome to Managing Marketing and today I’m joined by the CEO of Bench, which is a programmatic platform, Ori Gold. Thank you, it’s great to be here. Look the reason I wanted this opportunity to sit down and have a chat was a couple of weeks ago I was sitting in a marketing presentation for the industry and you were the speaker and you put up an example of Alexander Fleming’s discovery of penicillin, his accidental discovery, and it just blew me away because it was such an interesting metaphor to use. Why did you think it was such a relevant metaphor for that audience? Thanks for that, I am happy I did strike a chord. For me I think, what we try to do at Bench and my role as a CEO leading the company, we try to take the complexity out of marketing as it is today. For me I think when we have innovation and investment in one area we always need to look around in other areas to really learn where we are going with it because a wise man once told me within a fish bowl view we can’t really see the progress. And when I used that example it was very clear for me that discovery of Alexander Fleming with the antibiotics or penicillin and its potential, it took about ten years to scale that up and it’s been about ten years since we’ve got a bit of a revolution since RTB started within marketing. But then it took another 50 years for us to really understand how to better use antibiotics and for me I think antibiotics are so great although we overuse them. That’s the two first associations. It feels to me that with marketing, what we are trying to do today is that we have great advancement of technology but we overuse it or we don’t know how to use it correctly, or misuse it, that for me is the link between the two. Are people being overwhelmed by the pace of innovation and change? It’s incredible, we’re living in the most amazing time in human history as far as innovation goes. The actual technology-driven innovation is relentless and yet there are so many great opportunities presenting themselves. Do you get the feeling there are people that are just completely over whelmed by the opportunities? Yeah, I not only get the feeling, I feel it every day, which is a bit of what we are trying to solve. I think it is overwhelming to tell you the truth and I think it is not the people’s fault. I think it is the innovator’s approach to it. There’s no fault to be pointed out anyway, just progress with time. I am sure that when we just started to drive cars it was quite confusing and then accidents started to happen and then here we are, we have a great system to manage that from the human side and I think it’s the natural progress of innovation as we know it, is kind of like scientific or technological breakthrough, a bit of innovation there and then us people are kind of like catching up with it. I think the understanding and the ability or that this is the point of time we are at, is key to the solution. A bit like any other problem, we sort of recognise the problem and say this is where we are. I think it will help us find the way out of being overwhelmed with so much information and data. I think specifically in our time we need to change our mind sets. With Google, I think it was one of the initial tag lines, ‘don’t keep it, search for it, right. Don’t store it’ don’t tag it, don’t try to systematically tag it to little folders, just let it be, released and search for it. It took five to ten years for Google to get to where they are. The search engine was there, people used to ask, it’s like Yahoo no, it’s just directory, but no it’s something else and I think it is our approach to things that need to change and part of it is to let go. Let go of control when there is high and rapid innovation and a lot of changes, let go of control a bit, understand that we are in that situation, I think that will get the guards down and the overwhelmed feeling down and then to understand, hey we’ve been there before, we can benchmark from other areas and then move slowly to the next step and be fine. One of the things I think in this relentless innovation is it has been driven by commercial interest. They want to innovate and then they want to commercialise very quickly to prove concepts, to build revenue, that in many ways what’s happened is that the end user in marketing is actually being overwhelmed. 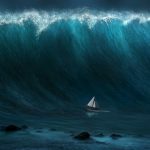 The reason they are being overwhelmed is because they are getting this constant bombardment, this is the latest thing, buy this thing now and yet in actual fact, the core of great marketing is a well-developed strategy and what strategy seems to be getting replaced with is tactical responses to the innovation change. The idea of here’s my strategy, how does that fit in with my strategy?, has gone by the way side and just with the sheer volume of innovation people are getting caught and marketers are going, I better be doing that and a bit of this, what do they call it, the shiny new thing. I think spot on, and it’s fine. We have to be a teenager and go through that weird awkward stage in order to become adults, and I think it’s kind of like two sides of this thing. One is to allow ourselves to explore in that way and to taste and to understand we may have less of a significant outcome in that point of time, but we have to go through it in order to explore what we need and what we want and give a new set of eyes. To get more maturity and actually understand how to use things and which of the innovations I need to use that benefits me and the rest is just noise. So that’s one element and from the other side I completely agree with you that many of the organisations today are in these situations and many marketers are testing tactical things and forgetting the big picture. I think the most important thing for us to understand, definitely marketing but in business as a whole, that it’s technology to serve us not us to serve technology. Technology by itself is not a standalone win. We always have to start with a What, then figure out the How, then go back to the What and if we get stuck to the How, then the questions we ask ourselves How do we do that, how do I track it, how will I upload this? And the answers are probably a sign for us we are not on the ball. It’s interesting because we do a lot of work with marketers, just reviewing their strategy and I love that strategic process, where are we now, why are we there, where do we want to be, how do we get there and then will we know when we get there? To me that is such a basic five-point plan, that you just apply any opportunity to. Where are we now and why are we there? And where do we want to get to? Does this technology enable me to do that and if it does do that, is it part of the how and what’s the measurement? It’s just a very simple approach but I find so many people in business are overwhelmed by the technology because they have lost sight of the strategy. Yep. I share the same view and I think this is one of the enemies of innovation. It’s a lot of time with decision makers within the organisation and I think they feel overwhelmed and rather than recognising it and admitting that maybe they don’t have the answer, they forget to speak about the direction and let other people solve the rest. They may feel a bit conscious about the lack of knowledge in a specific area that they suddenly let the tactics lead the way rather than be comfortable with the fact that although I’m the decision maker and I need to make this short, that maybe I don’t know because there’s a new thing in town or probably fifteen thousand of those. But a marketing or operations manager doesn’t need to change much in what they want and what they want to achieve and how to get there is maybe a few tweaks and not to be overwhelmed by these innovations but keep the same what and strategies that we’ve had for many years. One of the conversations we’ve had around for instance programmatics is that the approach is very similar in the way you do it at Bench to the scientific method. It’s really about what is the hypothesis that we want to test and then using the tools that are available to you to actually test it very quickly and get very quick responses back on what’s working and what isn’t. How important for you is that scientific test and learn approach? I think it is key. When we spoke before about the new set of expectations, that is the core pillar of these expectations. To understand the cycle is much faster, the learning is the best outcome that we can get and have small measurable cycles of learning; once a day, once a week, not more than that, is the key to succeed with these new tools and innovations. It takes time to setup. I think there are two components of mastering it. To take the time and set it up properly where the outcomes of that setup should go to my work. I can define in simple terms as I used to do before this innovation kicked in; what do I need, where do I go with that, what do I want to see back? We all learnt it and we’ve done it for years and to not wait three months for it but to actually get the answer next week. To really spell out the scientific method; it’s observe, observe your business, observe your marketing, observe the publishing data that’s available to you, these are all observations that then inform a hypothesis. I hypothesis is simply a statement that you want to test to see if it is true or not. So that would be to go to market (programmatically) against a particular segment and test it against another hypothesis to see which one gets the best results. Then when you get the results of the tests, one or the other or neither is proven to be better so then you are informed, you put that observation back into the beginning and you start again so it’s this constant cycle of improving based on testing and learning. What’s better than that? Even the Beatles got turned down the first and second time when they tried to get their albums with a particular company, and they are the Beatles, and once they got the contract signed and the album out, suddenly everyone forgets about these two attempts that failed. They are still the Beatles, no one can take it away from them. You can’t succeed without failing first and like you’ve mentioned, the beautiful thing about programmatic marketing and about the scientific approach entering into that space is that you no longer need conversations with stakes to be wrong or super high. You can fail, it’s a pleasure. Let’s celebrate that, let’s fail every day. As long as you have learnt. It’s like Edison, 5,600 different filaments, that’s a lot of filaments, and he goes “but every time one failed I knew that it was one less to have to test”. Exactly and it’s the pleasure of that better approach and before it was not enabled but now it’s enabled but we’re not using it. To refer to your first comment it’s like not using antibiotics, like still doing bloodletting in the 21st century. Exactly. It makes no sense suddenly. Technology is already here. It’s only asking us to change our mindsets and start to celebrate learning. Part of the collaboration at Bench is that every time we find ourselves in an argument that’s a test. Every time we disagree there’s a test here. Let’s put money on it. Let’s make it fun. Let’s get something from the other side and just like in rugby you can tackle the other person and then you can go and have a beer with him; that’s the game. The game of let’s argue, let’s do the test, one of us maybe right, one of us maybe wrong—it’s all about the game. Because every step you’re moving one step closer to success. It’s about managing that successful trend sustainably. It’s superior. You’ll get greater results over a longer term than punting a successful idea or some major marketing campaign, which can be maybe once a year and then three dry years. So, one of the things with your Fleming example, it’s infamous for being seen as a mistake. He’d left the Petri dish with the bacteria colonies sitting out on a window sill only to come back the next day to find that the penicillin fungus had killed all of the surrounding bacteria. The other famous example is Newton getting hit on the head by the apple and from that having thoughts about gravity. But the fact is in both cases it wasn’t just an accident because they were already thinking about this. Now, I’m just wondering; in your experience in the work you guys do, do you get happy accidents in the testing and learning that you do? Are there sometimes unappreciated anomalies in the results that lead to a whole new line of thinking? I love it. It’s a great thing that you’ve mentioned. It’s true that it’s not the accident; it’s the mindset of you understanding what you’re looking for which really gives the a-ha moments and the progress. Definitely, once you master separating the what and the how and once you understand how innovation can contribute you start looking for these signs. You want to get into the office with new ideas and then you suddenly see the world in a different way, as a different place, in different colours. Success comes with good planning and readiness but has a major component of luck in it. If you’re ready to hone in on an opportunity every second of the day then you will succeed. If you see the opportunity and you can’t execute it or act on it—sometimes you’re actually blind to it. So, here’s another view of that. I think it was Jack Nicklaus who as a golfer they’d say, ‘oh, you’ve won so many opens and you’re so lucky’ and he’d go, ‘it’s funny; the harder I practice the luckier I get’. It’s that idea that it’s actually the application to the methodology that creates an awareness of looking for those lucky opportunities. I think it’s by applying yourself. It’s interesting because most traditional businesses are very much based around command and control. They set up with a view in mind. They build an infrastructure. They do a reductionist process of optimising their process to market and they seem to think we’re going to head in this direction and off we go. In the last few years we all hear about these disruptive businesses; the Ubers, and the AirBnB, and Amazons, and Alibaba, and all those. But in actual fact the fundamental difference from my perspective is that rather than traditional business (which is I’m going to go in this direction and this is how I’m going to do it) they’ve all set up with a mindset of there are potential customers out there; how can we use this piece of technology to actually fill a need that they want? And constantly be able to pivot and reshape (in a way, test and learn). There are very few start-ups that have been successful in what they set out to do. In actual fact they’ve become successful by learning to constantly pivot to what the results in the market are. It’s true, isn’t it? It’s true. I’m completely there with you because it’s about letting go. Letting go of that control and that master plan that you have to execute. There’s a saying in Yiddish, which in English translates to ‘men plan; God laughs’. The way the world operates in reality and the way we see the world is quite subjective. It’s not real. It comes from a delusional perspective. Which is that we have control. I think Plato said that as one of his greatest findings or philosophies but I think it’s about letting go and understanding that a master plan is fragile so if you’ve got to try it, it might be better or maximised but it has a much higher probability to just break and fail. But if you let go and your plan is just the beginning of the game and you’re really happy to react and reshape the plan and not necessarily be right then I think you are maybe less maximised at that point in time but you’re much more flexible and much less fragile when winds come. Now, the world is big and innovation comes right, left, and centre and when you have a lot of uncertainty, flexibility is better than speed. More agility. Adaptability because it’s crazy times—we can’t foresee what will happen. So, getting back to science—this is absolutely encapsulated in chaos theory and complexity theory. Everyone’s heard of chaos theory about the butterfly effect and the fact is the butterfly flaps its wings in a Brazilian jungle and it causes a hurricane off the coast. But then under chaos theory the butterfly could also flap its wings and nothing happen—it’s the total unpredictability of the chaos theory. A much better domain in science is complexity theory because complexity theory says it’s so complex it’s impossible to know cause and effect but you are absolutely able to put a test into it and see what the overall impact is on that eco-system. What you’re describing is to have a plan but not be wedded to it. Have a plan as if it’s an experiment and when you put it into the marketplace you’re constantly monitoring to see if you get a positive outcome or a negative outcome. And at some point you go, ‘you know what, we’re not getting the results we expected but interestingly something’s happening here so let’s pivot’, which to me is agile. Yeah exactly that—agile approach and it’s kicking in to many businesses and I think it’s an exciting time for us when we can really, as people, focus less on hierarchy, control and being right and today, enabled by technology and many other advancements, to actually collaborate more, have more conversations, allow ourselves to be wrong. For me it’s relaxing rather than overwhelming. So, what’s at the core of that? A lot of people feel a huge amount of anxiety about accepting that there are no definitive solutions. Let go. In layman terms, it’s letting go but to really understand it’s a journey and setting the environment and the expectation right just as much as it’s a technology and marketing question. And I think understanding that and understanding that if your environment is not set into that type of comfortable space then this is the challenge that you need to conquer rather than the technology or marketing challenge. That will tell you what is needed to get to the other two, I reckon. One of the big scientific breakthroughs (and it was in the 50s) for me was in quantum physics—the Heisenberg uncertainty principle. Heisenberg postulated or theorised that for a sub-atomic particle it was possible to know its position at any point in time but the more you knew its position the less you knew its velocity and direction. What I liked about that was that we are so used to thinking in definitive ways. A car is moving along at 60kms per hour but at any point in time we can either know its position or its velocity—we can’t know both. It’s really interesting because so much of marketing and even business strategy is based on knowing both when science tells us you can’t know both. It’s based on making decisions based on empirical measures when so much of it is not empirical. It’s a very good point. My wife is always asking me, who is your best musician and who do you like the best? And my answer is why do I have to choose one? Life is a bit more complex than that. It’s less fun sometimes without an answer but I think it’s more true to the real world and what we want to achieve. A more interesting answer to that is at this point in time it is X but two seconds from now it could be Y. And you’re sleeping on the couch—being a smartass you sleep on the couch. A lot of people today, and I’m talking about my Israeli background and the Israeli ecosystem that is very innovative and kind of like a start-up nation. And one of the core things in Israel nothing is definitive compared to let’s say Australia which is a very regulated country. You as a person in everyday life when you go to the bank you expect to get a definitive and clear answer with what is the next step. When you go to a bank in Israel nobody cares about you and the answer is ‘look, we don’t know, come back later, and maybe you can do this or that’ and you really need to explore what is the next step. I think, as you mentioned, the core of innovation is to let go and understand that things aren’t as simple. We only fool ourselves. We only synthesise and simplify it until we get comfortably on with our lives but it’s not the reality out there. Once we let go and embrace a better approach of being comfortable with complex answers. Being uncomfortable with stochastic answers, which are based on statistics on what you think will happen next. Well, it can be X or Y or it can be 30% X or 70% Y and that’s called complexity. And if you keep on sampling it closely and asking the same question I think we’ll find simplicity within the complexity. There have been many scientific innovations and the world is absolutely richer for many of them. Is there one that for you is particularly profound? Is there a scientific innovation that for you is particularly profound generally and specifically in what you do? Hard question. Do I really need to choose one; can I sleep on the couch? You could sleep on the couch; it’s nearby. I’m with you. I’m just thinking. In the world of what I do and with marketing I’d say RTB is definitely a big thing. Real time bidding kicking into marketing is like antibiotics to medicine. I really think that’s the biggest breakthrough and I think we are kind of a bit in the woods now but in five to ten year’s time everything will be real time bidding in our world as marketers. Because it enables you to respond and test and learn very quickly. Correct because it’s the greatest enabler for what we’ve just spoken about; putting the scientific framework—test, learn, evolve and lowering the stakes of being wrong to a really minimal degree. I think it’s at the core of that and for me when you have this breakthrough that it’s not that technology advancement that is resulting in the success; it’s enabling so much other innovation it excites me. It excites me because then suddenly you have data scientists who can do so much within marketing and create so many applications that marketers can pool creativity, that application can be born—dozens of them every week and every month and for me it’s great, it’s fantastic. Because it really has disrupted the cascade approach to marketing—this whole idea of this is a long-term strategy, we’re looking at three to six months to roll something out because what you’re talking about in real time bidding could be done in 24 hours. You can do it daily. Correct, you can do it daily. Daily come back to the office, have a nice idea, throw things out there, get some reaction back and move on. Think how much time in meetings it saves. It excites me as a marketer, as a technologist, as an engineer but also just as thinker about opportunity. I just laughed because you know what most of those meetings are? People trying to second guess what’s going to happen because they’re having a succession of meetings with multiple stakeholders all arguing about (like you said before) who thinks we should do A or B? Whereas with real time bidding you can do A and B and get the market to tell us. All of these meetings are just a succession of consultations with all the stakeholders to second guess the possible result. The egos come out and then control comes out and then people do not let go they just hold back even more. Take positions and suddenly that position is more about them as a person and their importance to the organisation. Exactly, and who needs that, right? If we want status at work that’s great but if we look at it on a greater scale, we want to get results and live our life happily, collaboratively but also do something productive with our day. Like Marx said there’s a spark there that if we create something as people we get a rush out of it. So being able to go into the office and actually create something it doesn’t mean egos will stop but when those situations come it’s a nice doorway out saying ‘hey, let’s just test it. Maybe I’m right, maybe I’m wrong. Let’s stop talking and just test it and come back and laugh about it’. Because so much of the time marketers are committing to a piece of work is actually pre-guessing, isn’t it? It’s a bit like (was it Aristotle or Plato?) an idea is like a rock and it’s put in the centre of the room and then everyone comes into the room with their rock and smashes on it to see if they can break it because if they break the idea it wasn’t a good idea. That’s a very western philosophy whereas an eastern philosophy is an idea is like a drop of water and the role of everyone is to bring more water and add to the drop so that it turns into a river and a river can make all sorts of things happen. So, I think the different approaches are interesting because business is very much around that western idea whereas as you say with real time bidding we have the ability, if you’ve got an idea, we can be innovating on a minute by minute basis and then testing things to see what’s working and then learning from those tests. I strongly agree and to a western middle to high management decision maker it might be intimidating to get some eastern philosophy into their mindset but I think it’s probably the same mindset you mentioned before—look at the scientific approach. It’s about failing just as much as succeeding. It’s about getting the next layer, about getting your hypothesis either right or wrong. There are professors out there who spend their entire life on a big hypothesis and at the end it’s wrong and everyone’s clapping. They still publish papers. They still have status and prestige and that’s fine. Now, a western manager in an organisation needs to recognise that and that’s the reason we all speak English and that’s the reason the western world is defined by Europe when they discovered the scientific world a few hundred years ago. I think taking that approach and mindset and saying it actually works—this is what got us here so I know it works. It’s not foreign to me because I went to school, college and university; I understand how it works I can actually do it today. I don’t need to go to the Far East and find myself and new ideas. It’s actually right here, right next to me. 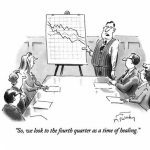 And maybe in academia you can take a few years to test the hypothesis but us corporates need to do it every week. It’s in small cycles. Well, here’s a fundamental difference between a commercial application of science and an academic application of science. That is in the academic application of science there is an incredible importance on peer review, which will slow down any innovation. From the discovery or results of an experiment it then has to be reproduced by a number of peers before it’s then acceptable because it has to be reproducible. It doesn’t occur in business because we’re competitive. If I find an innovation or an opportunity I’m not going to go to the marketplace and share it with all my competitors because I’ve discovered that. It’s what gives me the competitive advantage. It’s a fundamental difference. In some ways, it’s a flaw but we’re not necessarily dealing with people’s lives so on that basis avoiding the peer review is probably allowing us to adapt and move forward faster. That’s a very good point; I love it. I’d love to keep talking to you about this; it’s a fascinating topic. Thank you for coming and having a chat. Darren, it was a pleasure. I enjoyed it very much. We should do it more often. And just one last question. Who’s your favourite scientist?